Why the following multiply verilog code does not multiply ? Besides, in order to debug the code, I need access to the variable "middle_layers", but gtkwave is not giving me access to it. Why ? I have also tried formal verification using yosys-smtbmc, but surprisingly the code failed even the simplest cover(in_valid) which I do not understand at all. 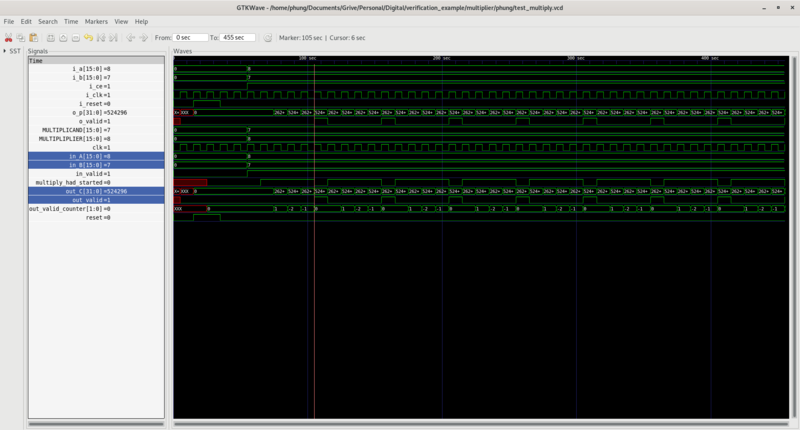 is the maximum clocking speed degrades quickly as the size of the bitwidth grows. thus smaller final routed silicon area. // of them, the multiplicand, as the value of the other one, the multiplier. // first layer has "SMALLER_WIDTH" entries of data of width "LARGER_WIDTH"
// Imagine a rhombus of height of "SMALLER_WIDTH" and width of "LARGER_WIDTH"
Last edited by promach; 9th February 2019 at 01:59.
does something in modelsim, though the answer is wrong. 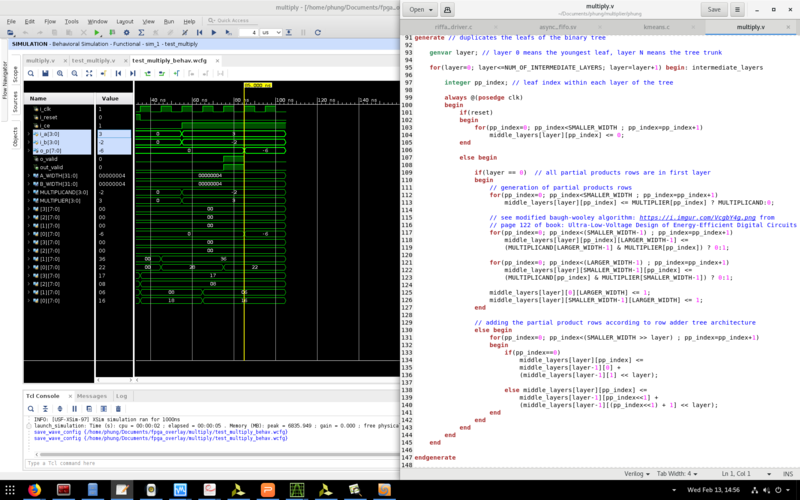 FYI modelsim doesn't add the waveform for the middle_layers array either using add wave -r * (have to add it manually). I believe it defaults to not adding arrays as they may represent large memory arrays which you don't normally want to simulate, it might be a similar problem with the VCD output you are generating from whatever simulator you are running. You'll probably have to explicitly add that signal for VCD output. Depending on how you generate your reset in the testbench, I would move the reset over by half a clock cycle, I don't think either edge of your clock sees the reset go active as you use a synchronous reset. In my modelsim sim, I generated the reset pulse on the falling edge. Note: I am using iverilog, not modelsim. test_multiply.v:36: error: invalid module item. 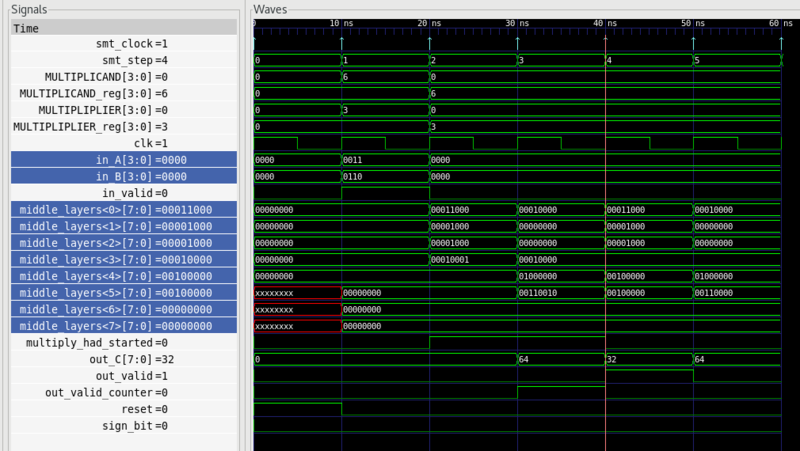 I just got my cover(in_valid) passed in FORMAL verification, therefore I have the following waveform to investigate. Note that the middle_layers bit length does not match the bitwidth described in line 91 of multiply.v . Why ? Note that the middle_layers bit length does not match the bitwidth described in line 91. Why ? You shouldn't even have the ifdef stuff, you should use the Verilog 2001 parameter declaration in the module port and then use the Verilog 2001 named association for the parameter passing. You would then set the FORMAL definition of the widths from outside the code. You still had not answered why yet. For the ifdef issue, it is not the reason causing the bitwidth mismatch, right ? 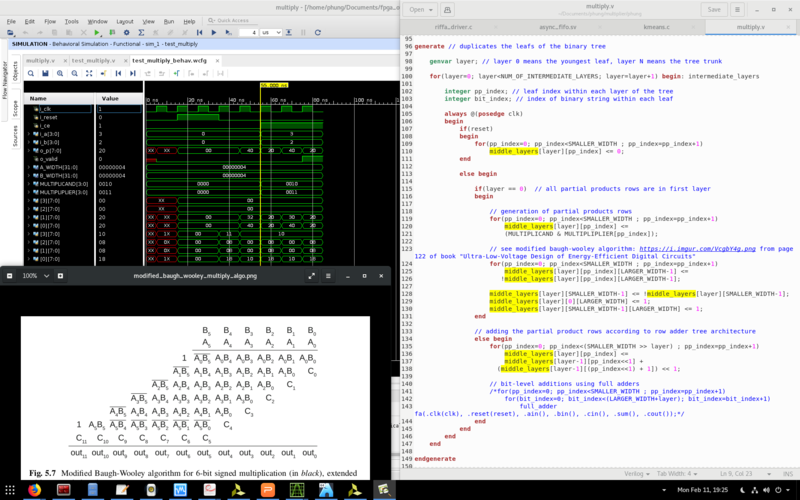 When I try with vivado builtin simulator, I am surprised that I do not face any bitwidth mismatch issue for the 3D array "middle_layers"
However, I still have logic bug where the multiplication result does not follow the modified baugh-wooley algorithm. Which part of the code in the screenshot below did I code wrongly ? You should use Verilog 2001 port syntax instead, given how it is now 2019, 18 years after that standard was introduced. I also would avoid using ifdefs, most if not all uses of them are really abusing them in some form or another. Also as defines are global in nature, they can result in problems elsewhere when someone uses the same `define somewhere else overriding the expected value somewhere else breaking that ifdef. well you also posted code with a typo, which you didn't do on that other site. I don't go opening arbitrary links so I only looked at the code you posted which has test_multiply.multiply.middle_layers which does not use the correct instance name of the multiply module, which is mult. Ever heard of the term GIGO? It stands for garbage in garbage out...post an incorrect question with errors and you will get a wrong answer. I stopped on the first error I see, didn't even pay attention to the bit slice stuff. Besides that I don't use iverilog and noticed that according to every release note for it, that it does support a lot of language features of even Verilog2001 and nothing from SV, so I refuse to waste time with it. Please keep the complaint about `ifdef FORMAL until later. I need them to use with yosys-smtbmc which does not support bind command yet. I am now debugging the generate coding since the multiplication (using modified baugh-wooley algorithm) does not work yet. // page 122 of book "Ultra-Low-Voltage Design of Energy-Efficient Digital Circuits"
On Icarus, you definitely need to dump each array row explicitly using $dumpvars, though you only have to specify the index/indices parts without having to specify the bitrange. This goes for VCD and for the faster database formats such as FST. 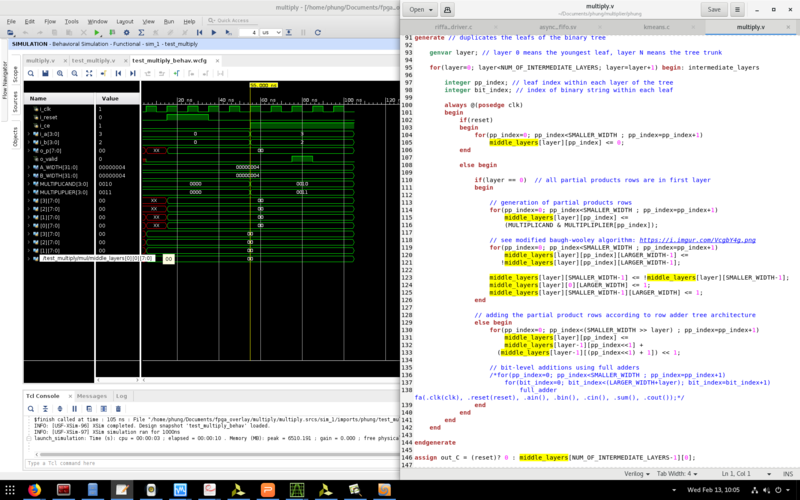 VCS and CVC automatically dump arrays fully without needing to step through them in testbench code--at least for FSDB. Signal names between Icarus and other simulators differ for arrays because Icarus escapes the hierarchy of the signal name where the actual signal name starts, probably because array rows contain '[' and ']' characters, probably to be compliant with what is in the Verilog spec. In order to be able to use the same gtkwave save file regardless of simulator, I wound up hacking my source for Icarus so the names dumped into FST would appear the same as for when I simulate using VCS. I have already solved the dumpvars issue for multi-dimensional array. The problem now is the simulation waveform does not follow the algorithm. if I comment out lines 119 to 125 , then I have all zeroes for the 2D array of vectors, middle_layers. Why ? MULTIPLICAND & MULTIPLIPLIER[pp_index] seems to be the culprit ? ?